EMILY HO was born into a traditional Chinese family living in a fishing village on one of Hong Kong’s outlying islands. As the fourth girl in the family, she has always used writing to develop a “fantasy empire” in which everything is possible. After experience in a travel agency in a hotel and as an account manager with a big telecommunications company, followed by a six-month period in New York, nine years ago she opened her own ice-cream shop on another of Hong Kong’s outlying islands. Her experiences and the lessons she has learned in this venture have been the driving force for her semi-autobiographical Memoirs, which she wrote at quiet moments in her shop. "This charming story of an ice-cream parlor in Hong Kong's Lamma Island is a whimsical mixture of crazy characters, wise sayings, anecdotes, history and fantasies. A story of love and betrayal, told simply and straight from the heart." Emily Ho (Memoirs of an Ice-Cream Lady﻿; far L) ﻿spoke at the HK Book Fair at seminars organised by OUP. Sitting next to her is another Proverse author, Gerald Yeung (Wannabe Backpackers). 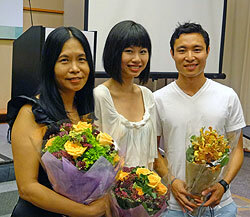 In the photo above, two Proverse authors pose: Emily Ho (L) and Gerald Yeunrg (R).